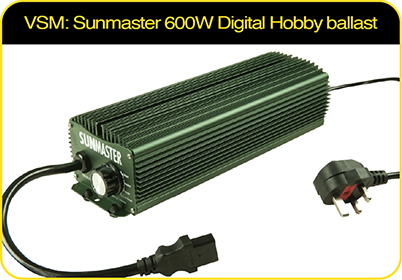 Available with UK or EUROPEAN plugs, the Sunmaster 600W Digital Hobby ballast has variable dimming and power boost to support the complete growth cycle. Dynamic high frequency control, 250W, 400W, 600W and 660W (power boost), with soft start-up technology and intelligent ignition for power surge protection.Sunmaster 600W Digital Hobby ballast is silent running, low temperature operation, with circuit safety protection – compatible with HPS, MH and Dual Spectrum lamps. Available with UK or EUROPEAN plugs, this range of Sunmaster Class 2 ballasts carries the Genuine Quality, Safety and Performance guarantee. Desirable compact and economical design, including a discrete carry handle , fully vented and complete with high quality input power and output lamp leads. 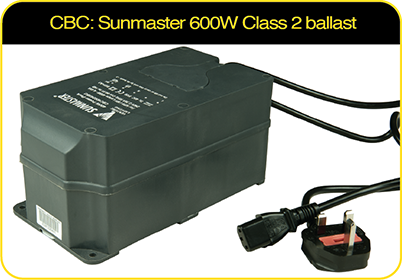 This Sunmaster 600W Class 2 ballast has quiet operation and is compatible with HPS, MH and Dual Spectrum lamps. Available with UK or EUROPEAN plugs, this range of Sunmaster Class 2 ballasts carries the Genuine Quality, Safety and Performance guarantee. The enhanced efficient design gives optimised thermal control to result in lowest operating temperature and is complete with high quality input power and output lamp leads. 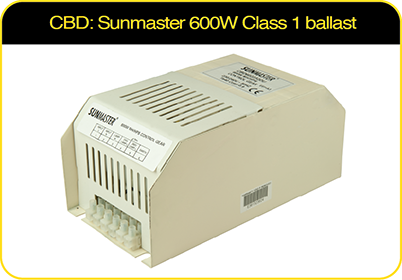 This Sunmaster 600W Class 2 ballast has quiet operation and is compatible with HPS, MH and Dual Spectrum lamps. 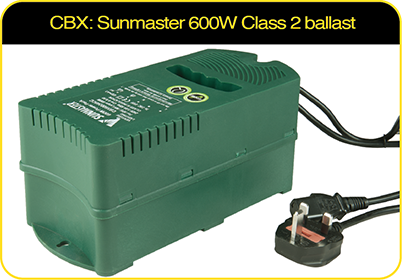 The range of Sunmaster Class 1 ballasts carries the Genuine Quality, Safety and Performance guarantee. The compact, versatile and economic design offers the lowest cost solution. This Sunmaster 600W Class 1 ballast has quiet operation and is compatible with HPS, MH and Dual Spectrum lamps. SUNMASTER iGROW controller is a device using Powerline communication technology to control SUNMASTER digital ballasts without additional wiring. SUNMASTER iGROW controller is equipped with functions to gain maximum control over a grow lighting with simple approach for connection and settings. Functions include basic switch ON and OFF times, dimming timer, dusk and dawn simulation for continuous dimming. Its unique design contains no high voltage relays.